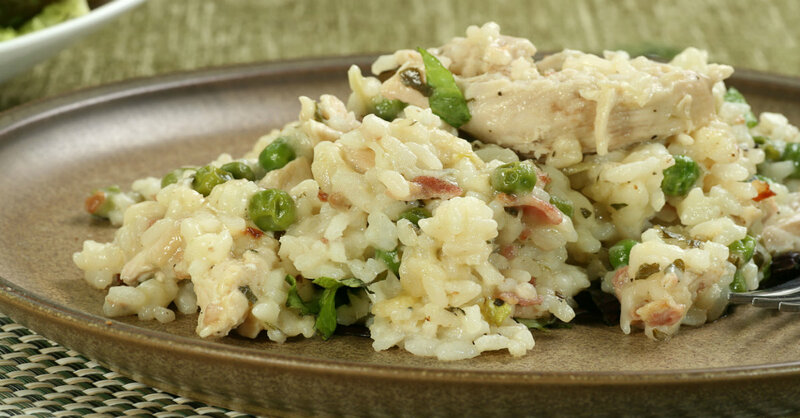 Forget The Constant Stirring – Pop This Risotto In The Oven And You’re Good To Go! We love risotto – especially for nights when we want to feel a little more elegant – but standing over the hot stove for 30-40 minutes is not our idea of a relaxing meal, no matter the delicious results. If only there was a way we could have our favorite dish without all the hassle…. By starting the dish on the stove and then transferring it to the oven, we only have to put in a few minutes of actual work, and then not have to worry at all about constantly stirring it and adding more liquids. Our oven-baked risotto is just as creamy and tender as the stove-top variety, and we love it even more for the time and effort it saves us! In a large Dutch oven or oven-proof pot, heat butter and oil over medium-high heat and sauté onion until softened and translucent. 6-7 minutes. Season with salt and pepper, then add garlic and cook for another 1-2 minutes, or until fragrant. Mix in white wine and cook until almost evaporated, then pour in chicken stock and bring to a boil. Place Dutch oven in oven and bake for 20-25 minutes, or until liquid is mostly evaporated. Stir in chicken, peas, pancetta (or bacon) and parmesan cheese, and mix together. Taste and adjust seasoning, if necessary, and serve hot. Doritos Chicken Casserole: Click “Next Page” below!